Mixing bowl and spoon in pewter Warwick miniatures FP10. 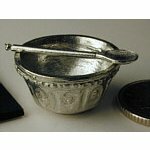 Home / Doll Houses & Miniatures / Warwick Dolls House Miniatures / Mixing bowl and spoon in pewter, Warwick miniatures FP10. Dolls house mixing bowl and spoon. Ready to paint or leave in pewter colour. The spoon is one inch long. Handmade in England. This is a collectors item only, not a toy.